The Chapter Lexington Park Over-the-Toilet Bathroom Space Saver instantly creates useful storage space in your bathroom. By fitting over the toilet, this space saving unit uses bathroom space that is normally wasted. 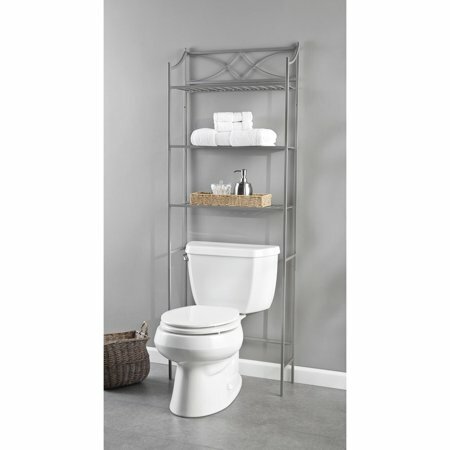 The space saver's sturdy metal construction and stable, wide slat shelves make it perfect for storing towels, washcloths, bathroom items and decorative accessories. Three shelves provide plenty of storage space. The space saver fits over all standard and most specialty toilets. Very easy to assemble, looks great and very good quality. I love it and it bolts to wall to avoid pulling over on kids or elderly. Easy to assemble! Fits great for a spacesaver, recommend using the hardware provided to secure it to the wall. Loved the price and the nickel finish. Easy to put together, looks awesome, and adds that extra bit of storage space we needed. I ended up liking the unit and it fits my needs. Pros: Price is great ($20). Fit very nicely over my toilet and it gave me ample space to store items. I like the 2 optional positions for the bottom cross-bar. The top hole did not fit because the bar lay on the water pipe. But the bottom one fit just under the pipe. Cons: As with most other units of this kind, reviewers complain about sturdiness, especially if you don't secure to the wall, which I didn't because I rent and because the mounting hole faced the border between tile and wall. So when I stood the unit up, it did feel flimsy. What I did was stuck 2 self-adhesive pads under the two front legs. That way the unit naturally leaned against the wall. No way is it going to fall in any way unless someone pushes it. So, I'm happy with how it stands. Also, I knocked off 1 star because the drilled holes for the bolts and screws are a little untrustworthy. I was surprised that I couldn't easily thread the bolts by hand. Had to apply pressure on some of them, to the point that the metal on the bolt head bent. I had to return one unit, which Walmart gladly and quickly replaced. The replacement unit was a lot better in that aspect. Still, be careful of the threads. Start with very little pressure and work slowly. The box it arrived in was close to being destroyed. Couple of very minor dents. It says satin nickel, not brushed, and that's a big difference. It's a very nice piece. Put together easy and used brackets to attach to the wall. A nice offset to all the brushed nickel accessories in my refurbished guest bathroom. Recommendation: the worst would be not liking it and returning. Well made. Easy to put together. It's a little on the flimsy side but all in all a nice set of shelves. Easy to assemble. The metal was supposed to be satin nickel but looks more like gray paint. Not very sturdy but once it was attached to the wall it was perfect. Looks great in my guest bathroom. Shelves were a little bit wider than the legs and a little flimsy. Once attached to the wall it feels much sturdier. I wouldn't recommend this piece. It's described as having a satin nickel finish, but it's really just a matte gray. If you have other bathroom hardware that actually *is* satin or brushed nickel, it won't match. The unit is also rather cheaply fabricated, with small spot-welds through which you can see spaces. I wanted to like this shelving unit because I liked the slat-style shelves, but I'm taking it back. No assembly instructions and no hardware to assemble the product. I'd return it but no car. It is assumed that a product needing Assembly come with all necessary hardware.I'd try to find the hardware at a hardware store but that would cost me extra money plus dragging a piece on the bus to get to the store. Therefore I am stuck with this piece of junk..This is not the fault of Walmart but rather it is the fault of the vendor who sold the product to Walmart for poor qualirty control --mai9nly making sure all needed parts are included or a phone number to request parts. I got no assembly instructions and no customer service number for the vendor who sold the product to Walmart.I'd give it zero stars but that is not an option.